Adding new items in the RadGridView is done via the GridViewNewRow control. It appears in the form of an empty row and allows you to enter a value for the field of each column. None: Do not display the new row. Top: Display the new row on top. Bottom: Display the new row at the bottom after the last standard row. Please note that this mode is supported only when GroupRenderMode is Flat. As of Q3 2013 the ShowInsertRow property is marked as Obsolete. Instead of it, you can use NewRowPosition property. You can have an always visible new row by setting NewRowPosition property of RadGridView. Note it will be visible even when the CanUserInsertRows is set to False or the IsReadOnly property is set to True, however the user will still not be able to use it. The default text of the GridViewNewRow is "Click here to add new item". However, you can change the content by creating a custom LocalizationManager, override the GetStringOverride method for the GridViewAlwaysVisibleNewRow resource and apply the custom manager to your application. Figure 3 shows the result after the custom LocalizationManager is applied. 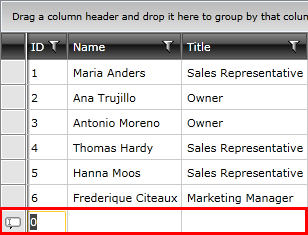 To learn more about how to utilize GridViewNewRow take a look at the Adding New Entries topic.